Teaching early childhood mathematics as the subject of research is undervalued next to literacy. This is a highly mathematical structure built by a Kindergartener. Do you know how to pull the mathematics out of this task in a meaningful way? Do you know how to evaluate his knowledge and skills? Constance Kamii has written several articles that I have found quite useful. Take a read and see what you think. Both offer activities that have opened adult eyes to “see” the assumptions we make about what is easy or hard in math. Remember what is “first grade” in the Kamii article is based on American curriculum. Expectations in early grades are very different. Her tasks are informative. Want to make a shift in your attention to numeracy ? 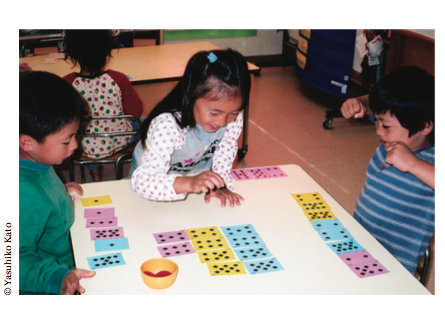 Looking for ways to make the mathematics in your “games” and centres authentic? Hoping to make literacy connect to math in more learner friendly ways? If you are not puzzling, you are not preparing learners for success in mathematics! Consider joining me for the first 2 days of Summer Institutes 2018. Pre School, Kindergarten & Grade 1 teachers, we will dig deep into the foundations for mathematical thinking that our students are missing at all grades and how to address them in “play- puzzle- think” ways.